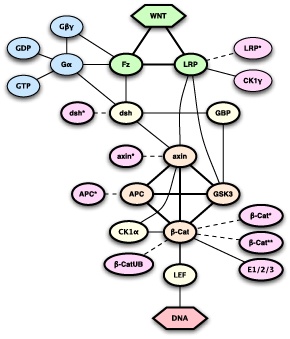 Interactions of genes and gene products as well as cross-talks between individual pathways make up complex networks that preclude an intuitive understanding. Along with the increase in knowledge on genetic interactions, mathematical modeling and simulation have become indispensible tools for the analysis of regulatory networks. Modeling approaches vary in the degree of abstraction, which influences the level of detail, but also comprehensibility and the amount of information required to specify the model parameters. Our research covers the highly abstract Boolean models as well as comprehensive models based on differential equations.